You can never have too many reusable, washable fabric shopping bags or market totes. 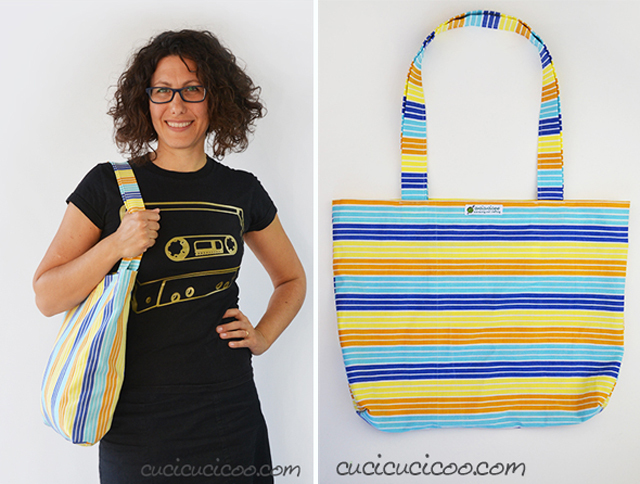 Lisa, from Cucicucicoo Ecological Living, shows how to make the One Square Tote Bag. French seams make for a neat finish on the inside, without the need for lining. There are a few styles to choose from within the one detailed tutorial - with or without boxed corners, wide and short or deep and narrow. There's even a little zippered pocket on the inside for keys, cash or mobile. Molto bella! I tuoi modelli sono sempre spiegati BENISSIMO!Sicuramente la farò.